Are you ready to be the best helper Santa has ever had? Well in order to be the best, you need to first be the jolliest. You need to almost be able to match ole St. Nick’s level of jolliness! That may seem impossible, but anything is possible with the right outfit! Grab this Elf Costume from our collection and you’ll be sure to stand out from the sea of helpful elves. This holly- jolly Elf Costume is bursting with holiday cheer. Its primary colors are the two most prominent Christmas colors, green and red! You’ll be covered in these festive colors from the top of your head to the tips of your toes. The tunic also has a fun jagged hemline and there are adorable pompoms on the toes of the booties. This costume will make you look almost like a present, all wrapped and ready to go. And that is basically what you’ll be to Santa! When you go around in this fun costume, you’ll be doing the big guy a huge favor with all the holiday cheer that you spread. After all, he is powered by holiday cheer! The more cheer there is then the more powerful Santa is and the faster he can go around the world giving gifts to all the boys and girls. It’s simple Christmas science. 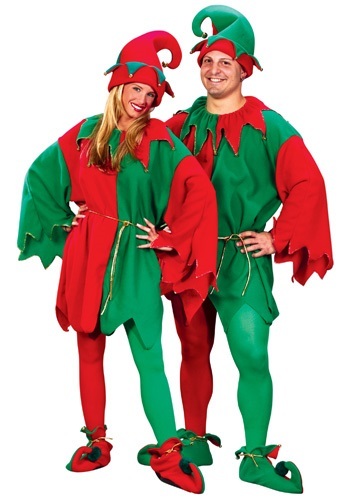 Do your part in helping Santa Claus this Christmas season by spreading holiday cheer with this Elf Costume. You’ll be sure to deck the halls with boughs of holly during this, the season to be jolly!